From Ashlea in the eighties to Spitfire today, smaller pools and ponds of, often, less than an acre, have been throwing up monster carp for decades. Yet despite the fact that you’re seldom more than a few yards from your quarry, these tiny waters can actually be the toughest to crack. You’ll find several more modestly-apportioned venues in the Angling Lines portfolio – many of which are home to some real chunks. But far from a pushover, these fish are masters of their own environment: they know instinctively when they’re being fished for; and will hightail it to the other end of the pond when spooked. 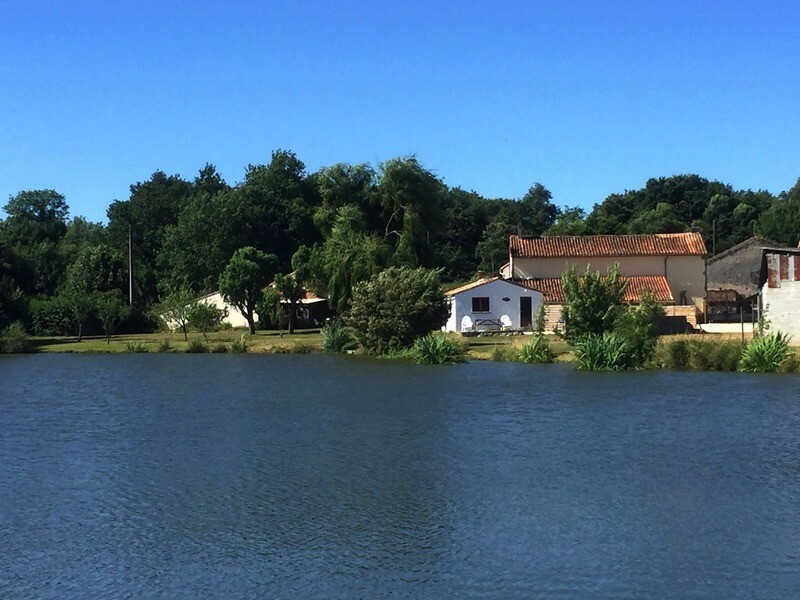 So how do you go about targeting the bigger carp, on these kinds of venues? Well, as with all carp fishing, location – finding those spots within spots on which the carp are most confident feeding – is paramount. 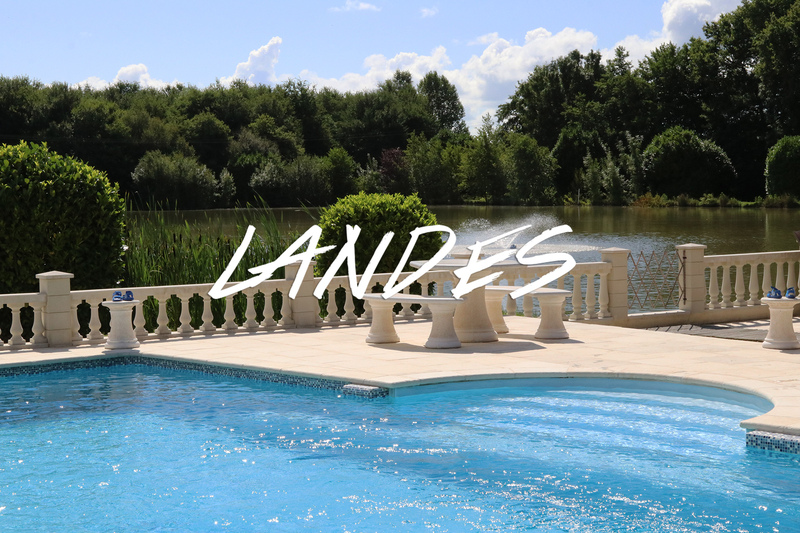 More than simply ‘watching the water’ however, these diminutive destinations demand a more peripatetic approach: though you may be able to see –possibly even cast to – the entire pond from your bivvy door, you’ll learn so much more if you take time to walk the banks. 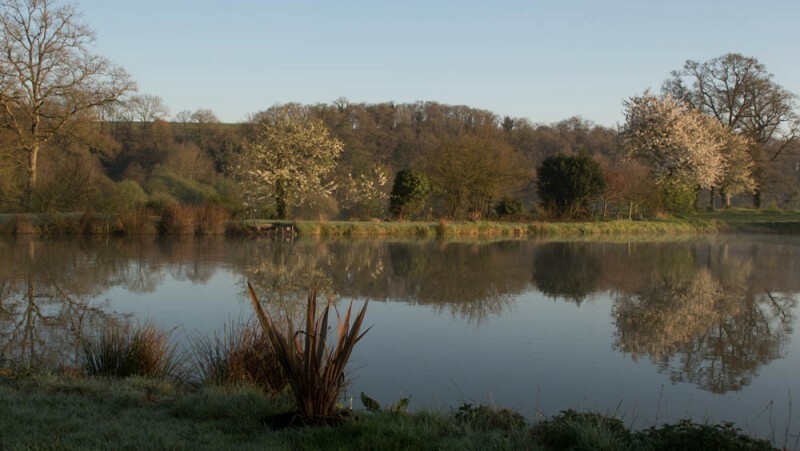 From pinprick bubbling to clear spots amid the weed – and if you’re lucky finding fish feeding in the edge – you’ll gain a far fuller picture by scouring the venue ‘up close’; taking time, naturally, to prime any likely areas with a few pellets, boilies and chops for a possible later return. Climbing trees will afford you a more complete, ‘joined up’ picture of the pond, its topography, carp and importantly their patrol routes. And of course those very trees may be great holding spots for carp too – offering shade on sunny days, protection from predators, and a natural food larder thanks to a steady trickle of berries and insects falling from their branches. Talking to other anglers will also give you a good steer as to where the fish have been slipping up; and maybe how. But, as ever, take any advice you receive with a healthy dose of salt. On these kinds of venues, you’re competing with your fellow anglers as well as the fish. So, don’t be afraid to go against the grain – scoping out less popular (and thus less pressured) areas. The Holy Grail: areas that aren’t fished at all. Whilst the ‘going’ swims may turn up plenty of carp, there’s a hint of self-fulfilling prophecy about the whole thing: carp get caught where they’re fished for. But how many are, by turns, ‘getting away with it’ – or steering well clear? More popular swims will see greater footfall. And the fish will be well used to navigating their way around anglers’ lines. 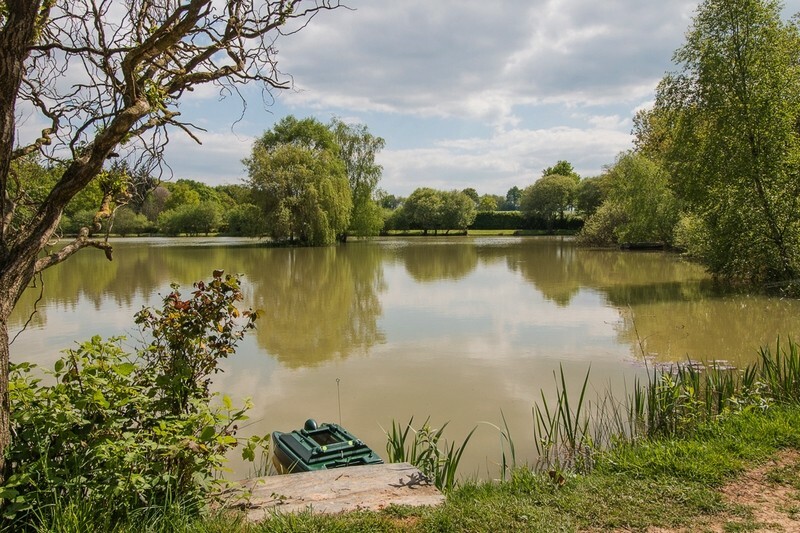 By contrast, those rather ‘awkward’ overgrown swims – which most anglers breeze straight past – may be regarded as safe havens by the carp, who may hold up in numbers, amongst the overhanging branches, lilies and reed stems. That’s not to say, these same areas may not be fished to – by anglers casting from the far bank. But smaller venues make for ‘spottier’(not to say, spookier) carp; and the spookier the carp, the closer to the pads, snags or undercuts you need to position your rig. Being ‘there or thereabouts’ may not cut it. So, however accurate your short-range casting, there’s no substitute for donning the chesties, and getting in amongst them – dropping your rig directly into Mr Cypry’s dining room. Then covering your tracks – burying your line with the toe of your waders as you back out. That, my friends, is confidence in a can. If you learned nothing else from those childhood episodes of Go Fishing, you’ll know that casting shadows, being silhouetted against the skyline, and vibration of any kind will spook fish – even carp on commercial style waters that see loads of pressure from clumsy clod-hopping carpers, all year round. So keep bankside noise to an absolute minimum – wherever feasible lowering your baits into attractive nearside margin spots (rather than drilling them in with a two-ounce lead from the opposing bank); then opening-up the bail arm on your reel and retreating well out of sight of patrolling fish – slackening off and allowing your line to sink fully, before attaching your bobbin. In these situations, the Slack Line Vs Tight Line issue is not up for debate: if you’re fishing in a couple of feet of tap clear water, the carp will shy away from your lines if those lines aren’t pinned down. Fact. So wherever possible, I’d choose a fast-sinking fluorocarbon line – which should all but disappear on the deck – pinned down with putty and/or a flying back lead. Regards rigs, the accepted wisdom is to scale down on smaller venues; to fish as light as possible, with tiny leads, baits, hooks, etc.. But I disagree. In the same way that unfancied swims can yield a bonus fish or two, going against the grain, rig-wise, can make sense too. And in a lake where the carp are especially canny, the smallest tweaks can spell the difference between a banger and a blank. So dare to be different. If the fish have gotten used to, and become adept at dealing with, small running leads, do the opposite. Gear up with 4-5oz semi-fixed leads (you’re only dropping them in the edge, remember), short hooklengths and big – size two or four – hooks. Subtle? No – but very effective. Especially in situations where you could be ‘getting done’ regularly and unwittingly, simply because you’re failing to set the hook effectively. Big baits – of 18mm plus – are harder to deal with, too. And, as importantly, they may deter those pesky bream, tench and silvers– all of which will be intent on transforming your immaculately prepared, strategically positioned rig into an ineffective bird’s nest. Target them off the top. Floater fishing is of course one of, if not the, most selective ways to target the bigger specimens. So if the rules permit, and fish are showing on the top, waste no time in getting those floating baits – breadcrust, dog biscuits, whittled down popups or whatever – in amongst them; getting the carp ‘Pac-manning’ confidently, by feeding little and often, before overcasting, drawing your hookbait in to the baited area; and preparing either for explosive action or (let’s be honest) hours of frustration. Where the presence of other anglers allows, keep a close eye on the spots you baited during your recce, too; grabbing a rod, a mat and a few bits and bobs, and spending an hour or so in any areas that the carp appear to be visiting. Don’t reserve those stalking sessions for the daylight hours, either. Instead, leave your fellow anglers to their bivvy heaters and their iPads – and get out and find them. Going against the grain in this way – tracking down feeding carp when and where they’re most confident – will always help you put more fish on the bank; whether you’re tackling a windswept inland sea, or a half-acre farm pond.